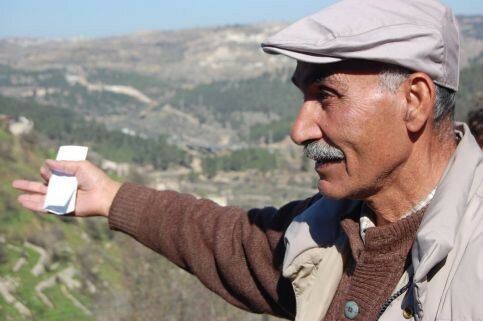 Yakoub Odeh was forced to flee Lifta with his family at the age of 8 in 1948. Today, he lives in East Jerusalem, just a kilometre away from his former home. How does it feel to live so close to Lifta? It’s very painful, every day, to know I’m so close to my own house and land, but that I cannot live there. In East Jerusalem, about a kilometre from Lifta, in a house that I built with three other families. The house is in my wife’s name. Four months ago, the court said we must each pay half a million shekels, because we built it without a permit. If we don’t pay, they can demolish our homes. But if we’d applied for a permit, we wouldn’t have got one. Only 5% of Palestinian permit applications succeed, so really we are just wasting our money by applying – it costs $35,000. Also, we have to wait five or six years for them to process the application. It’s very expensive to build a house in Jerusalem anyway, which is why I had to do it with three other people. What other restrictions do Palestinians face in building homes? Palestinians are allowed to build only two floors with a garage; the Israeli homes meanwhile have six floors of more. And Palestinians can build only on 75% of the plot. Since the state of Israel was created, 86% of Palestinian land has been confiscated; only 14% remains. Since the occupation, we have built 37,000 houses, on 7% of that area – so you see we are being squeezed off the map. We have no room left to build the houses we need for the future. The average occupancy in a Palestinian home is 6.5 to 7.5; for the Israelis, it’s no more than 3.5. They say it is the way we prefer to live, but actually we have no choice. How is daily life in East Jerusalem? We need 23,000 housing units to solve our housing crisis there; we are very overcrowded – an inmate in prison has more space than a Jerusalemite. Living conditions are bad. We have poor facilities and no amenities. Our streets are dark; we have no public spaces; no gardens. For every one shekel that’s spent by the authorities on East Jerusalem, 10 shekels are spent in West Jerusalem. We pay 35% of our income in tax in East Jerusalem, yet we get only 5% of the city’s services. Meanwhile, 60% of us live under the poverty level of $2 per day. Can you imagine, they confiscated my land to build a road, but I’m not even allowed to use the road! South African apartheid continues in Palestine. When our kids go to school in the morning, we don’t know if they’ll come back alive. Then when we need to travel, there are at least 10 checkpoints around Jerusalem. If I just want to go to Ramallah, I have to stand and wait in the sun or the cold for two hours, along with heavily pregnant women and little kids, while the police laugh and joke with each other. It’s not good for our mental health. But these are the facts of our existence. What memories do you have of Lifta? My strongest memories are of going to school in the village and of playing beside the spring with my brother and sister. Our house is just 35 metres from the spring. And then we’d sit on our verandah and look at the panaroma of the village you can see from our house. I remember the last funeral in the village – that was Ahmed Zucker, killed in front of his car while trying to move his kids to safety. They shot him in front of his children. Women were crying, it was the afternoon. Soon after we had to leave Lifta. It happened one day when my mother was making the fire – the militia started to shoot, and my little brother grabbed my mother’s legs, and she moved us to the lowest storey of the house, where we kept the animals, and we hid in the corner there. After that, the adults moved the kids out, nine families in one big truck. They covered us with a blanket because they were afraid they would shoot us. But I peeked out of the blanket and I remember everything was very green. It was spring. I was only eight, but I remember it as though it were yesterday. Where did you go when you left the village? First we went to Ramallah – it wasn’t a camp, because we slept in the open until we were given a tent. We were followed there by a military plane. We went to open air school there that someone managed to improvise in a circle of stones; later, my mother and sisters lived in one room, while I slept with my father and brothers under the trees. My father died two years later – he was still young, but stress killed him. In time we moved to Jerusalem to be nearer to Lifta. We built a house in a place called French Hill. Later, the militia demolished it. What did you take with you from Lifta? When our parents had carried us to the truck away from the shelling, the militia shot at my father. He wasn’t hurt, but he was wearing traditional dress, and there were two bullet holes in his robe. When she had to leave, my mother kept the robe, and she also took the house key with her. In 1969, when the militia demolished the house we had built in the area known as French Hill, we lost both; my brothers returned to the rubble and found the key, but there was no trace of the robe, unfortunately. Our father died early, so it was our mother who became our teacher. I’m so proud of my mother! My philosophy is, you have to love all mothers as though they were your own mother, all children as though they were your own children. If you don’t do this, then you don’t love your own mother, your own children. Do you still hope to return? Yes I do. And my children do too. We go for picnics in Lifta, and I tell my kids all the village stories – about their grandfather, the neighbours, the animals. I sometimes think Lifta memories are even more vivid for them than for myself. And my own memories seem to get fresher – it’s as if the place reveals more and more of itself to me. There are 37 Lifta refugees in East Jerusalem and Ramallah, and we have a Lifta Association; and now the internet makes it possible to keep in touch with those that have moved further away. We all want to return to our village. I’m sure we can achieve our dream through peaceful means. There’s a study by Salman Abu Sitta that shows that all the Palestinians can go back, and there’s enough room for us all to live together with the Israelis. We will never give in. They say that every human being is born in the land, but for us Palestinians, our land is born in us.